EPoS provider Mhouse launched two new products at its recent trade show. 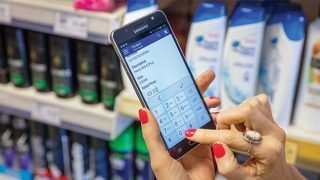 The first, a smartphone app named Saleschecker, gives store owners the ability to monitor the performance of their business remotely, with key store metrics updated hourly. The second is a hybrid self-service addition to the company’s Mpos system. 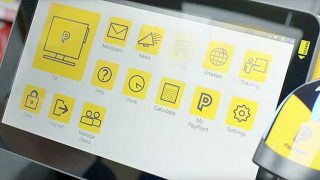 By touching a button on the screen and turning the display round to face the customer, retailers can quickly set up a card-only self-service channel. The event also featured a demonstration from 1080 CCTV which showed how its hardware seamlessly integrated with tills running Mpos . Retailer Mohammed Rajak of Day Today Buy Well in Bridgeton, Glasgow was celebrating after winning a brand new Mpos system at the event. “I’m very pleased to have won this – it’ll make a big difference to my business,” said Mohammed, who hit the headlines last May when Camelot revealed his customers had raised more than £2.2m for good causes since the National Lottery’s inception. 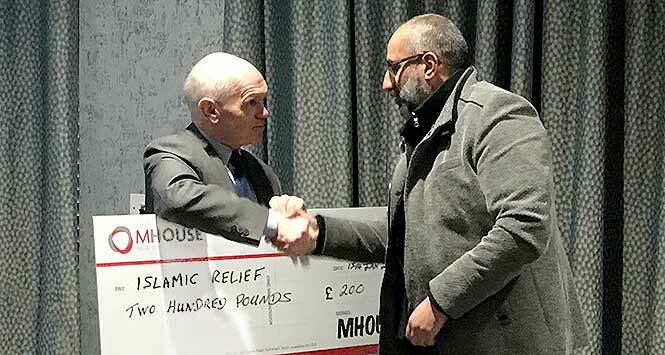 A cheque for £200 was also presented to the Islamic Relief charity at the show (pictured). The total was based on how many people attended the event. “It was a good way to give a benefit to a truly deserving cause that our clients will appreciate and want to support,” explained Faisal Sattar, Mhouse Operations Director.